Making Of "Winter Is Here"
In this making of (the 1st of many more to come) I want to share the making of "Winter is Here" image. It's a photo of a storm over Tel Aviv, Israel as shot from the city of Jaffa that overlooks the entire coastline of Tel Aviv. 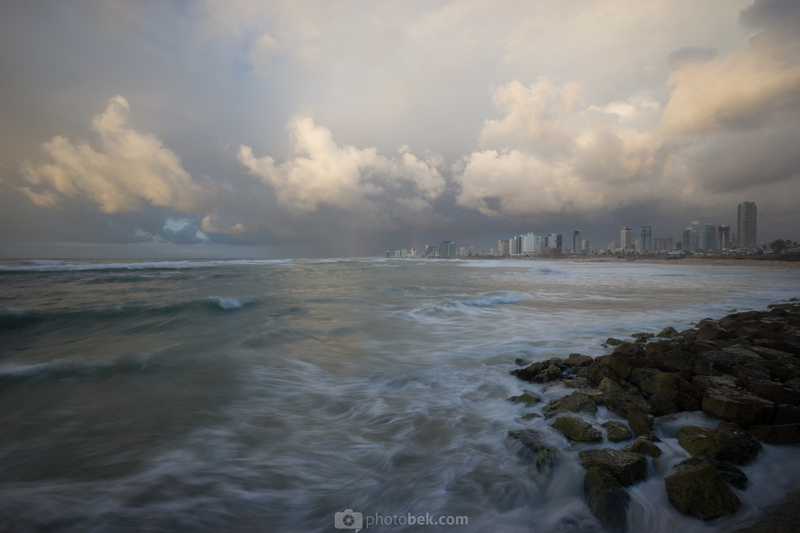 We don't get too many winter days here in Israel so even though I hate the winter and I hate the rain, I try to make the most of it by at least getting some good photos while I can as the only good thing about winter is the great cloudscapes it brings along with it. As I was sitting at the office I noticed that the sky is filled with clouds and according to the forecast it seemed like it is going to stay that way and that some rain will be coming in the next hour or two. It was around 4pm and I knew that sunset will be around 5:30pm so I figured i'll pack my things and go out to get some shots. Hoped on my bike and drove to a fairly new vantage point for me that I have no idea why I didn't visit more often as it is very easy to get. I practically parked my bike right on the sidewalk and all the shots I took where no more than 5 meters from it. When shooting water I always try to shoot long exposure so I can get the fog and "smudge" effect on the water so I have a 3 stop and a 10 stop ND filters. I took out my tripod, attached my camera and started shooting. Added my 3 stop ND filter and was testing different exposure times in order to see what works best with the water and clouds. Usually 1-2 seconds won't have a big impact on clouds but it will have a great impact on water and waves. For this specific image I wanted the white foam of the waves to create sort of a leading line that will guide the eye towards the city and the cloudscape above it. That's why I set the frame so that white foam starts at the bottom left corner and creates that "leading line" towards the rocks, the city and eventually to the center of the clouds. Also, as you can see the clouds also create sort of a "leading line" from the top right corner down to the center of the image. 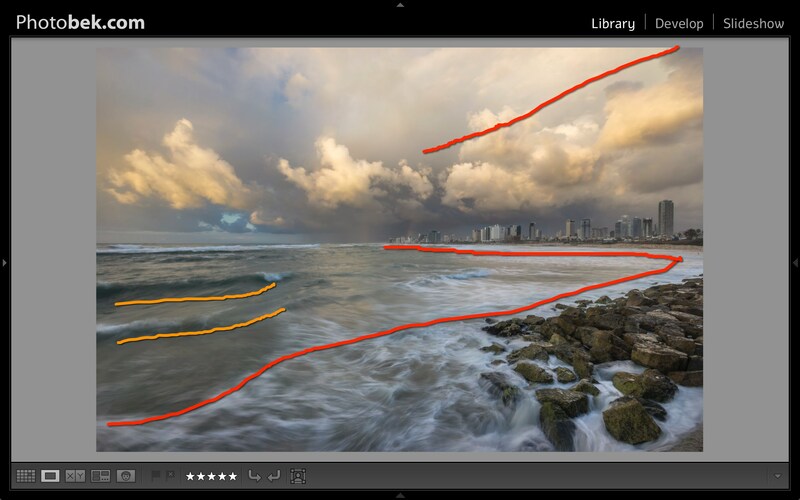 There's also additional smaller such "leading lines" created by the waves to the left of the frame. Shooting is just 50% of the game and post processing takes the other 50%. I mostly use Lightroom for editing my images and sometimes I also use Photoshop and Color Efex Pro 4 (by Nik Software). For this image, all editing was done in Lightroom and i'll break it down into steps as I hope it will make it more clear. 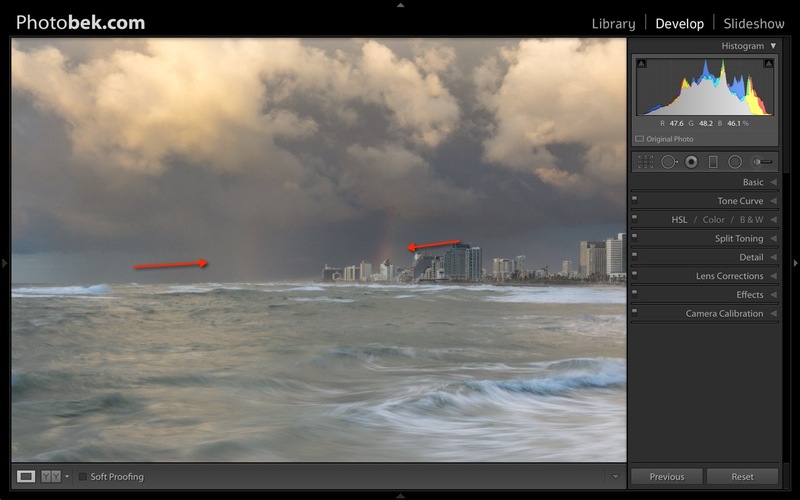 Lens Corrections – Enable profile corrections and remove chromatic abberation. White Balance – I change to Auto and see what I like best. In this case Auto looked better than As Shot. 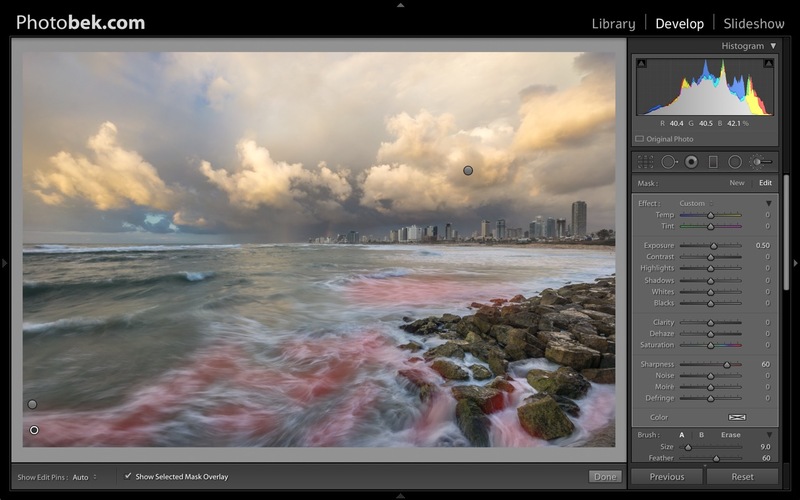 Highlights – dropped to -100 as it makes the clouds "pop" and have much more definition. Shadows – increased to 56 to get more details from the rocks. Whites – Increased to 43 to get more brightness in the water foam and clouds. Blacks – Increased to 13 for better contrast overall. Clarity – Increased to 39 to get more detail definition and "drama" overall. I still felt like something is missing, especially in the sky. It didn't have the same color it had when I took the image. The sun gave a subtle gold color to the clouds and I wanted to get that back plus give it a sort of "punch" and accentuate the clouds and water more in order to add more "drama" to the image. I did some dodge&burn on the waves in the foreground in order to add more definition to them and make the white foam more apparent using the Adjustment Brush. And to finalise the shot I added some saturation and clarity to the clouds. Well, here I had a bit of a problem. Usually when I shoot this kind of images, with water and great cloudscape I find myself always going Black and White instead of color. So I tried it here and turned the image into Black and White adding some more contrast to make it a bit more dramatic but I didn't get the same feeling that I usually get when I go Black and White. I usually immediately feel like the image is better in Black and White. This is time I didn't. 300 comments was way more than I thought I would get and I want to thank everyone that took the time and shared his opinion with me. After reviewing the comments color came out as the big winner (198 vs 59) and it really grew on me as the better looking image in this case. Now, what do you think? Color or B&W? I took this shot with my great (and old) Sony NEX-7. I bought this camera almost 4 years ago and the model will be 5 years old on August 2016. It's old, it isn't a full frame camera but it doesn't matter. You can make great photos with any camera because its not about the camera so don't let that stop you! If you aren't shooting RAW already, than start today. Start today. You simply can't get the information you want in order to get the image you want without working with RAW files. I shot 88 images during this photo session. I shot from different locations, different angles, different exposures and I ended up with this one shot. Just keep shooting. It doesn't cost anything these days 🙂 I seriously doubt that anyone today is getting the perfect shot on the 1st click. Shoot as much as you can because you don't know what will be the "winner". 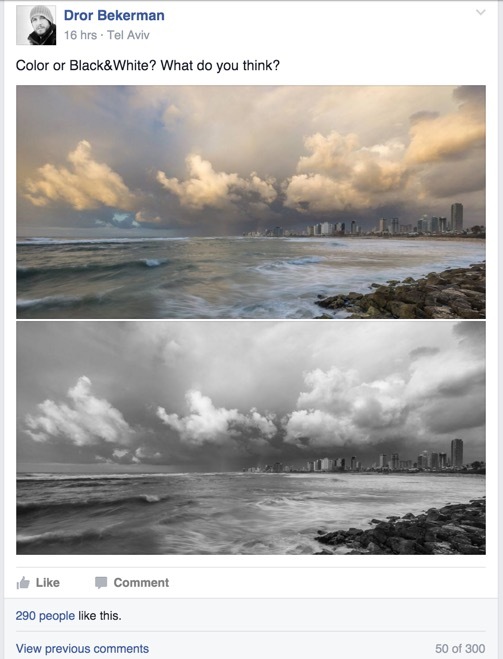 Plenty of times the image that I thought would be the "winner" and that I was most excited about post processing turned out to less than that and a different images was the real "winner". As you can clearly see, the post processing I did for this image is not complicated at all and was mainly only basic stuff that really anyone can do and it won't take more than 5-10 minutes. I consider this to be the 20% that gives you 80% of the final result. Of course I can sit for another hour (or hours) and go into Photoshop and post process the sh** out of this image but all that time will only bring me the remaining 20% of the final image and to be honest, in most cases and especially when viewing the image on smartphones and computer screen, you just won't be able to tell the difference. Did I miss something? Please feel free to share your thoughts or questions in the comments below. 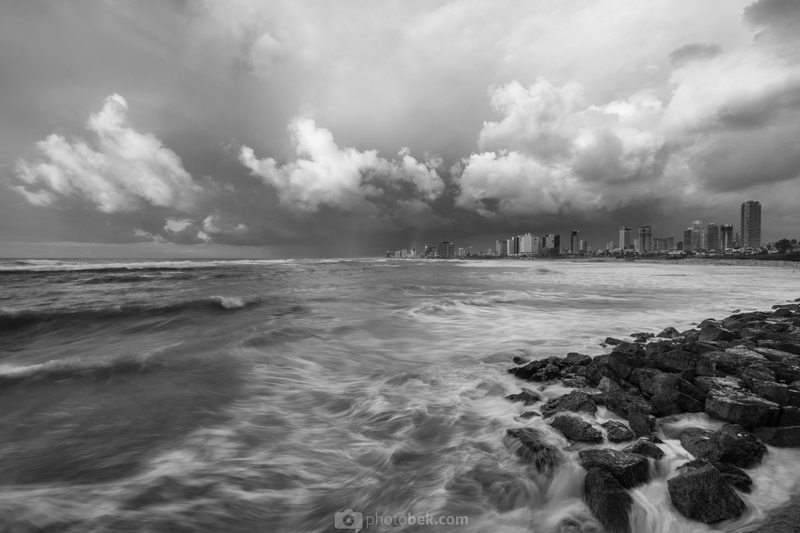 Become a truly great landscape photographer by only focusing on the 20% that actually matters! https://www.photobek.com/wp-content/uploads/2016/02/photobek-DSC06375.jpg 1600 2400 Photobek https://www.photobek.com/wp-content/uploads/2014/03/logo-blue.png Photobek2016-02-10 08:35:232019-02-18 16:12:44Making Of "Winter Is Here"